Much of the activity of the Gendell Center occurs in the energy design laboratory located in Hudson Hall of the Pratt School of Engineering. This space supports student teams in the capstone design portion of the Energy and Environment Certificate, as well as the activities of small groups and independent study students working on energy and environment research or design. It contains a design studio with software for drawing and finite element analysis; a conference area for presentations, meetings and seminars; and a fabrication lab with flexible space for student teams to produce and test their prototypes. The capstone experience of the Energy and Environment Certificate requires working on a multidisciplinary team to design and prototype an energy system, while considering environmental, market and regulatory factors. Examples of recent projects completed in the Gendell Center include a solar-charged emergency power system, wind-powered water purification, and a solar-powered neighborhood vehicle. 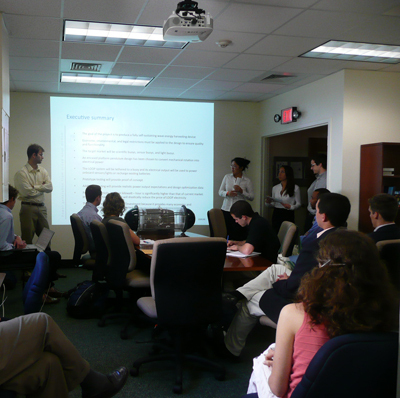 In addition to hosting the design teams, the laboratory also provides space for independent study students and teams to work on energy projects. Topics presently being examined include solar thermal energy, steam energy, and biofuel from animal waste.